Every seller’s goal concludes with increasing sales and growing the business. You’ve crunched your number and curated your perfect products. Now how do you get them in front of as many of your potential buyers as possible to make that conversion? That’s where eBay listing optimization comes in, and Kyozou is here to help you do it. Optimization covers a broad spectrum of topics that can range from titles, descriptions and category data, etc. Having an effective listing takes these into consideration and more, to gain better exposure, gather customer loyalty and ultimately grow sales. Think of your listing as a packaged presentation and it’s within the little details that make up the big picture. If you want eBay and your target consumer to take notice, make every detail within your listing work to your advantage, and pave that clearer path to buy-it-now. Set the stage for your listings by starting with the first thing your potential buyers will be looking at. The idea is to show up as the best match for what your target consumer is looking for by making this information easily visible through your titles, and the data that Ebay categorizes based on what you provide, work for you. Relevant and product-specific keywords are some of the most important factors to consider when creating more optimized Ebay titles. Maximize on organic search traffic by filling out the category data within your product specifics with a maximum of relevant characteristics. The item specifics entered when listing a product translate into filters shoppers use when searching for items. You will not only gain rank in the search algorithm (since you have provided lots of relevant specifications). You will also get free organic search traffic from customers looking for a specific characteristic. If ignored, listings will be eliminated from search results when people use the filter feature. Provide the most pertinent information to further outline an accurate representation of your product features and condition, and what your potential buyer can expect from you as a seller. It should only describe the item for sale and terms of sale, keeping in mind the consistency of information between your overall listing, from title to category data and description. Use a bullet form list format for an easy read. Be clear and concise while maintaining keyword-rich content that is free from grammatical errors. An overall reflection of your customers’ experience, and a good measurement of seller reliability from the customers’ point of view. Strengthen your fulfillment processes with a solid plan on keeping your inventory count accurate and organized. Beyond your logo and color scheme, this is a reflection of your business values, and your approach towards selling and customer interactions. A way to maximize exposure and sales for your listings. It’s an ongoing process that takes your target audience, marketplace algorithm, and buying trends into consideration. High interest and popularity of listings leads to a higher probability of conversion. Keep eBay historical data on successful sales in check, as well as seller expenses, when determining the value for product listing. Here’s an example of the criteria we’ll evaluate you by, and then work with you on improving. Stay competitive and rank higher on eBay’s search algorithm with an attractive and customer friendly shipping option. There is nothing more enticing than a free/guaranteed shipping option to wrap up a successful sale. Seeing the “Free Shipping” tag next to your product offering can be the deciding factor for a buyer to pick your listing over the competition. It appears to be a cost factor on first side but consider that you will gain additional sales and traffic through offering that shipping option. You can either incorporate some of the shipping costs within your selling price or through streamlining your shipping process and saving on costs. The key is to build up momentum and grow your sales, you can still switch back and charge a small fee after or even decide on setting up a free shipping requirement such as, minimum order quantity or minimum order value. 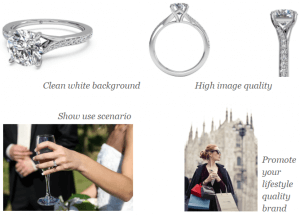 In an ever-changing online marketplace landscape, the visual representation of your products remains a crucial key factor for consumer purchasing decisions. Well-focused stock quality images, shot from different angles, on a clean white background, gives off a more professional look to your listings, and gets it ready for indexing in Google Shopping. Both are packed with relevant, product-specific keywords yet remains coherent. Does not use CAPS but rather capitalizes the first letter of every word to provide impact while keeping it readable. Grammar or sentence logic is unnecessary but eliminating typos is important for your search ability. Does not contain irrelevant words like ‘must have’, ‘fabulous’, ‘great gift’. Leave the flowery words to marketing strategy and description of product benefits. From brand, size, color, shape, style, manufacture number, year, country of origin, upc, etc. Is it pre-owned? Don’t forget to mention any flaws or special condition. Is it all original or are there replacement or refurbished pieces that your buyer needs to know about? This is where your grammar and sentence structure counts. Be descriptive while maintaining a professional tone. Proofread. A bullet-point listing format breaks down your sentences for better readability. Is it too wordy or too long? Convey information without causing buyers an eye strain. Be clear and concise. No one wants to read a boring story. Attract buyers by enticing them with how they can benefit from your products. Does it have any special features that wow? Remember your relevant keywords but don’t forget that you are writing content for readers. Don’t keyword spam. Kyozou is a Certified eBay Solutions Provider with direct API integration. Kyozou uses data sent directly from your eBay seller account to optimize your sales. 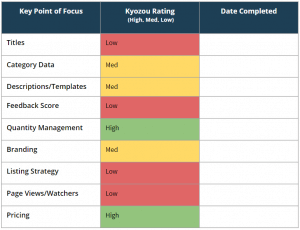 If you’re a Kyozou seller looking to enhance your listing strategy and take it the next level, contact your CSM today. We’ll custom tailor a listing optimization strategy for you with specific ways to enhance your listing titles, descriptions, shipping options and more. Not a Kyozou client but interested in enhancing your eBay business? Contact us today or give us a call at 1 (877) 596-9681.